Tufts researchers have identified a new target for treating particularly aggressive forms of breast cancer that could potentially save thousands of lives each year. Gail Sonenshein, a professor of developmental, molecular and chemical biology at the School of Medicine, and her research team found that when they injected antibodies to a protein called ADAM8—essentially turning the protein off—in mice with triple-negative breast cancers, the tumors stopped growing and did not metastasize. The research, which was funded by the National Institutes of Health among other sources, was published in January in EMBO Molecular Medicine. Over the last two decades, Sonenshein and her team have been trying to identify molecular factors that drive invasive breast cancers and could be used to develop more specific treatments. A few years ago, her lab identified ADAM8 in a screen for proteins that promote cell properties of aggressive breast cancers. Consistently, ADAM8 expression levels correlated with the severity of the disease and poor patient outcomes. ADAM8 was present in one third of triple-negative breast tumors and half of all breast cancer metastases. When the Sonenshein group reduced the amount of ADAM8 in breast cancer cells, they became less invasive but were still able to grow normally on plastic. Mathilde Romagnoli and Nora Mineva, postdoctoral research associates in Sonenshein’s lab, then set up a series of experiments in which triple-negative breast cancer cells were implanted in the mammary glands of mice. In the first experiment, they permanently removed ADAM8 from the triple-negative breast cancer cells. 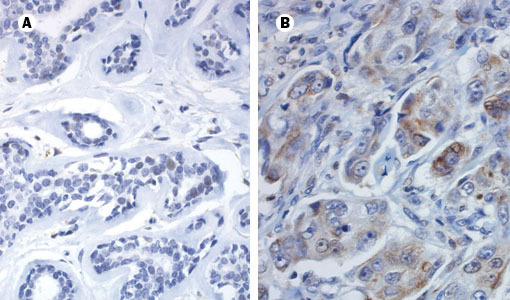 Tumors lacking ADAM8 grew only to a very small size, and no metastasis occurred. “It was a total surprise. We had expected only effects on tumor spread,” Sonenshein says. Their studies have found that ADAM8 plays two roles. Once tumors start to grow and reach a critical mass, they stop growing if they don’t have adequate access to nutrients or oxygen. ADAM8 sends signals that help recruit new blood vessels to the tumor, a process called angiogenesis. The blood vessels then feed the tumor with the nutrients and oxygen required for its growth. In addition, ADAM8 is necessary to activate proteins on the surface of the cancer cells that allow them to interact with the blood vessels. This gives them the means to enter and exit blood vessels, essentially promoting metastasis. When Irene Georgakoudi, Sonenshein’s collaborator in Tufts’ Department of Biomedical Engineering, and her colleagues tested the blood from the mice with tumors lacking ADAM8, there were very few tumor cells in circulation. To test whether ADAM8 would respond to antibody therapy, Romagnoli and Mineva used commercially available antibodies specific for the outside active portions of ADAM8. In animals that received antibodies to ADAM8, the tumors grew much more slowly, and most animals had no metastasis. The results “validate ADAM8 as one of the first targets for triple-negative breast cancers,” Sonenshein says. Sonenshein is now investigating various means to produce human ADAM8 antibodies that can be used to treat patients. Once these antibodies are developed, her group will need to test their effectiveness on the mouse models they have established, as well as on patient tumor samples transplanted into mice, a procedure called patient xenografting. Sonenshein will collaborate with a researcher at Baylor University for this work. Toxicity tests to make sure that turning off ADAM8 wouldn’t have any negative consequences would also need to be done before moving any antibody to clinical trials in humans. “If we can make an effective human ADAM8 antibody, and if all of the testing goes well, women with triple-negative ADAM8-positive tumors could be treated with this antibody and would have a more effective and less-toxic option than high-dose chemotherapy or radiation,” says Sonenshein. “At this point, ADAM8 is one of the best targets you could actually look for, because it appears to have no essential function” that would be missed if it were removed, Sonenshein says.